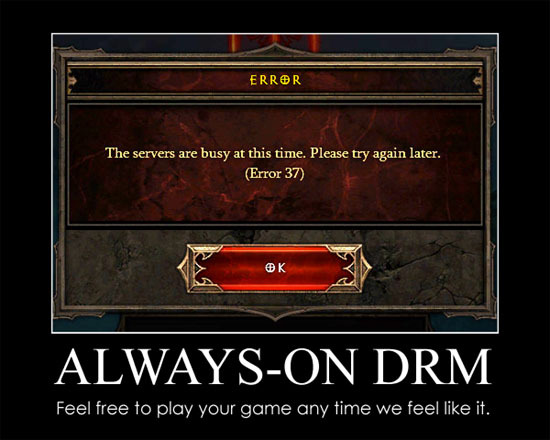 Diablo 3 is an excellent example of why DRM - and especially the always-on DRM - is a bloody awful idea. In fact, it’s arguably one of the worst video game launches in history. A week later and the game is still plagued with connection issues and miscommunication about downtime. Literally every second post on the official forums is negative. On top of that, there have been a number of claims of mass account compromises, but that is outside the scope of this post. Let’s observe four major problems with Diablo 3’s service quality so far. Legions of fans had waited over a decade for a sequel to Diablo 2. When they all attempted to play the game straight after the launch, the servers melted, rendering the game inaccessible to many. These angry fans took to Twitter, demanding to know why they couldn’t play the game they just spent $60-80 on. After the traffic calmed down and people were able to start playing, Australian players were still experiencing connection issues. Since there are no Oceanic servers, the game connects to the United States by default, leaving Oceanic players with high latency. In a couple of staff-created forum threads, quite a number of Aussie players mentioned experiencing an average latency of 300 ms and above. There are hundreds more of these threads created by players themselves. In my experience, the game is barely playable at 400 ms in Normal difficulty, but I wouldn’t want to be playing at any higher than 200 ms in Nightmare and Inferno, the most difficult two. Last night, on Tuesday 22 May, Blizzard took the US servers down for eight hours of maintenance. Apparently this maintenance was scheduled, but players weren’t notified about it anywhere except in the game’s login screen, and even then, some players reported that the message was not displayed for them. During the entire downtime, the Server Status page reported the game as available, and no notification was posted in the Service Status forum. Strangely, the server came up after a few hours and players were able to connect and log in, although they would be disconnected again within several minutes. Even though the issues were sorted out by the end of the maintenance period, Blizzard’s failure to communicate lead to many angry complaints on the forums, particularly from Oceanic players. The game went down again for another hour of maintenance on 23 May, and once again, the only notification was in the game’s login screen. As if the eight hours of poorly announced downtime weren’t already bad enough, it happend during Australian prime time - from 6:00 pm to 2:00 am, Eastern Standard Time. The Australian board was full of frustrated players who had come home from work to find they wouldn’t be able to play Diablo 3 until the following day. Blizzard completely ignored the international community by scheduling downtime at horrible hours. Of course, 8 hours of downtime is going to tread on somebody’s toes, but it would not have been an issue if servers were available in a wider range of countries, each with their own maintenance schedule. Although these issues weren’t caused by DRM, they could have been mitigated if Diablo 3 had a single-player mode that did not require a constant Internet connection. Like in the Diablo 2 days, players could simply go offline during connection problems or downtime. Instead they are completely locked out of the game. DRM is a tax on honesty and customer loyalty; a punishment for players who support developers and publishers with hard-earned cash, only to be kicked in the nuts. You would think that paying so much money for games these days would entitle you to a DRM and hassle-free experience, but that luxury is something money can’t buy - only downloaded illegally. How many more publishers need to implement always-on DRM before we start doing something about it?